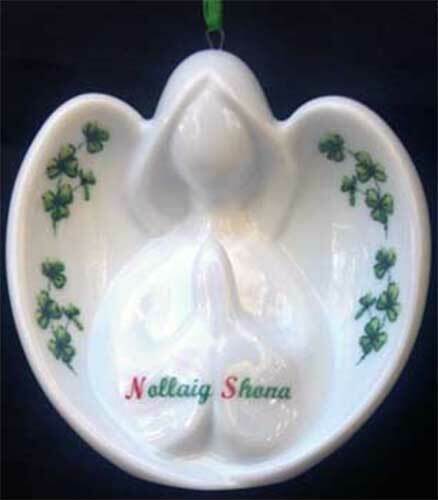 Nollaig Shona and shamrocks enhance this Irish angel Christmas ornament. The Irish angel depicted on this white porcelain ornament has her hands folded in prayer, and it is enhanced with the words Nollaig Shona along with shamrocks. The dimensional Nollaig Shona Irish ornament measures 3 1/8" wide x 3 1/4" tall x 1 1/2" deep; it may stand on a flat surface or you may hang it on your Christmas tree with the included green ribbon. You may also illuminate this Irish ornament by inserting a bulb in the base opening. Irish Christmas ornament features an angel holding a baby along with a blessing and shamrocks.